The north-eastern region of India was terra incognita till very recently and even now much misconception about its history and its place in India prevails in India and abroad. It needs to be emphasised that Assam, the foremost of the states of this region has been the eastern-most sentinel of Indian culture and has contributed to the evolution of Indian nation as much as any other border region of India. The three lectures comprising this volume were delivered as a Visiting Professor at the I.I.A.S. in November,1999. The main theme covered by the second and third lectures is woven around the two facets of medieval Assam that have largely moulded the Assamese society, viz., the rule and contribution of Ahoms (1228-1826 AD).and the neo-Vaishnavism of Sri Sankardeva (1449-1568 AD.). 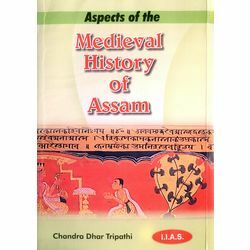 A perspective for studying these is provided by the first lecture which makes a general survey of the history of Assam from the earliest times to the advent of Ahoms. The author has convincingly established that Assam has been an integral part of India since the earliest times. She has always remained in the sentiments of the people of India as apart of their holy land and she has always possessed the Bharatvarsha consciousness. The north-eastern region of India was terra incognita till very recently and even now much misconception about its history and its place in India prevails in India and abroad. It needs to be emphasised that Assam, the foremost of the states of this region has been the eastern-most sentinel of Indian culture and has contributed to the evolution of Indian nation as much as any other border region of India. The three lectures comprising this volume were delivered as a Visiting Professor at the I.I.A.S. in November,1999. The main theme covered by the second and third lectures is woven around the two facets of medieval Assam that have largely moulded the Assamese society, viz., the rule and contribution of Ahoms (1228-1826 AD).and the neo-Vaishnavism of Sri Sankardeva (1449-1568 AD.). A perspective for studying these is provided by the first lecture which makes a general survey of the history of Assam from the earliest times to the advent of Ahoms. The author has convincingly established that Assam has been an integral part of India since the earliest times. She has always remained in the sentiments of the people of India as apart of their holy land and she has always possessed the Bharatvarsha consciousness.